Put simply, installing or repairing a satellite dish will directly improve the signal’s strength for your television, including extras such as Freeview. There are many factors that affect the aerial’s signal so if you’re suffering problems, be sure to bring in the experts. 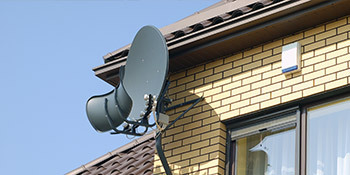 Aerials for digital TV such as Freeview and Sky need to be installed on an external wall of the property or chimney breast to ensure receiving the best signal strength. Professional engineers will be trained to find the best area to gain reception and heighten results. If you already have an aerial installed on your home but either the signal isn’t very strong or some channels aren’t appearing, it’s worthwhile upgrading the technology. Some of the older aerials can’t provide an adequate reception and a replacement will instantly boost your television experience. When an aerial isn’t receiving a strong signal or channels aren’t listed on your TV, you won’t always need a replacement fitted. Having a professional carry out a diagnostic check-up is one of the best ways to find a problem and help you save money on a new installation. If the existing aerial can’t be fixed, then the engineer will be on hand to replace. It’s not just domestic properties that can benefit from new aerials and repairs. Digital satellites and aerials are installed on commercial buildings too and diagnostic repairs and maintenance will be needed to ensure a signal remains strong and no problems will affect reception. Commercial properties include hospitals, businesses, hotels, pubs and clubs. Whether you need a whole new satellite installation or a diagnostics test to improve your signal’s strength, you’ll want to hire a reputable, professional engineer for the task. Just complete our quick form and hear from up to four vetted engineers, who’ll provide you with free, no obligation quotes for the work you need. Project: Additional satellite point installed. The service was very prompt and friendly. The information was very good and they arrived when they said they would. They were very polite and completed the job in quick time, not putting any pressure on needing extra equipment. I would highly recommend these guys to friends and family. The information was published right away and was pick up and fixed very quickly this was a good site to use. The below information displays the energy performance of homes in Uk. Energy ratings range from A to G, with A being the most energy-efficient and G being the least efficient. The Energy Performance Certificate (EPC) rating factors heavily when you want to sell your home, as possible buyers will see what amount they're most likely to be paying for their home heating expenses. Property improvements including insulation assist to drastically increase a home's EPC rating. The data beneath shows the diverse types of homes in Uk. The most commonplace properties all around the UK are detached and semi-detached homes. Other kinds of properties encompass terraced houses, flats, converted flats and bungalows. The information underneath provides an indication for the number of homes in Uk that are central heated and non-central heated. Households are heated by a range of sources which indicate how pricy annual energy bills will be. Examples of central heating include gas, electricity, oil, solid fuel and LPG boilers. Changing the way your home is heated can see you with cheaper bills. The information beneath shows the spread of houses heated up by different fuels. Throughout the United Kingdom the most frequent hands down are gas heated homes, followed by electricity and then oil. Biomass central heating boilers are also increasing in popularity, heated by eco-friendly products such as wooden pellets or agricultural waste.|Houses in the UK are warmed by a variety of fuels, which include gas, electricity, oil, solid fuel and LPG boilers. Each fuel has a varying cost associated with it and that means you could find yourself with less costly energy bills by switching how your house is heated. Even solar thermal panels are being regarded as by many people in order to reduce heating bills for the years to come.